Many people have second thoughts about their tattoos. Fortunately, you don’t have to live with your decision forever. Save 15% on your 1st Tattoo Removal Session! What sets Ritacca Tattoo Removal apart from other tattoo removal clinics? Dr. Ritacca utilizes the dermal clearing method, which breaks down the ink of the tattoo into fine particles, which your body rids instead of getting trapped in the lymph nodes. Our center is committed to excellence. We have successfully removed over 12,000 tattoos. We have an outstanding reputation in the Midwest for our pricing and our technology, and many professional tattoo artists refer us patients for fading or removing tattoos. Many of our patients have travel traveled from surrounding states and throughout the Midwest to seek the expertise of Dr. Ritacca and our center’s unparalleled, tattoo removal technology. In fact, Dr. Ritacca commonly treats patients with tattoo removal inks left behind with the “leading competitor laser”. We are so confident in our technology we offer a Tattoo Removal Guarantee. Call Ritacca Cosmetic Surgery & Medspa, Vernon Hills, at 847-367-8815 to set up your complimentary tattoo removal consultation, or click here to email us a photo and get a FREE quote. Technology – Groundbreaking PIQ4 Laser removes stubborn ink left behind by older lasers. Faster Results – Clearance in up 6 sessions vs. 16 to 20 older competitor machines. Pricing – Fewer treatments are required, which results in cash savings. Free Consultation & New Patient Special – 10% off your 1st treatment! With Competitor device, no further clearance. After 20 QS and 3 Picosecond Treatments. We are proud to offer breakthrough tattoo removal with our technology: PiQo4 lasers. You can erase unwanted tattoos with the most advanced laser treatment available for safe and effective tattoo removal. 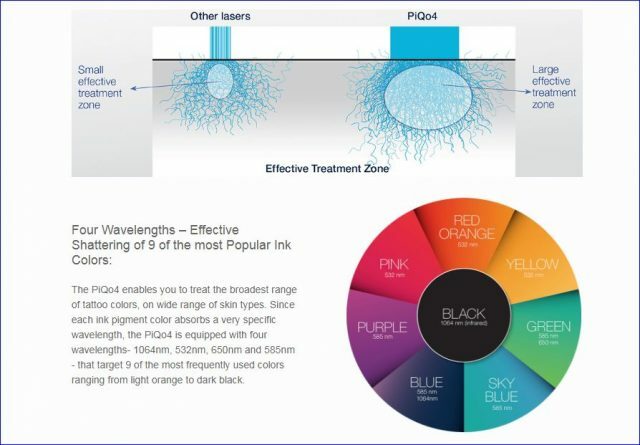 PiQo4 and other lasers target unwanted ink more effectively than ever before, successfully removing difficult ink colors, such as blues and greens, as well as previously treated tattoos. All this can be accomplished without damaging the surrounding tissue. You can’t be 100% certain of what your tattoo artist’s ink consists. Manufacturers of inks and pigments are not required to reveal the contents. A professional who mixes his or her own inks from dry pigments will be most likely to know the composition of the inks. However, the information is proprietary, so you may or may not get answers to questions. Most tattoo inks technically aren’t inks. They are composed of pigments that are suspended in a carrier solution. Contrary to popular belief, pigments are not usually vegetable dyes. Today’s pigments are primarily metal salts. 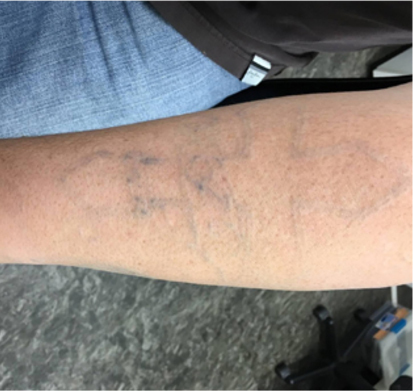 This is why breaking up the ink is not the best way for tattoo removal, as one needs to eliminate the toxic metals from the body. With the assistance of our erbium laser, we cause the dermis to shed the ink to the outside as opposed to only the lymphatics, which exposes the body of toxic chemicals and metals. Tattoo removal is both a personal and a medical procedure, which is why we highly encourage individuals to schedule a private consultation with our patient coordinator. 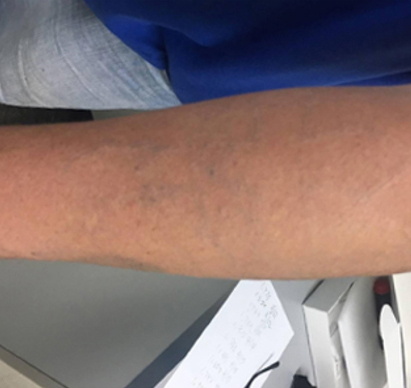 Ritacca Cosmetic Surgery and Medspa o pioneered the use of PiQ04 laser for removing tattoos in Illinois, to ensure quality patient safety and care. At Ritacca Cosmetic Surgery & Medspa, we offer a free tattoo removal consultation so you can finally get rid of your unwanted ink. Additionally, you can get a free quote for tattoo removal so you can get an idea of the price estimate. Your tattoo removal consultation will involve some paperwork, wherein you will need to provide information about your medical history. Furthermore, our patient coordinator will ask about your tattoos and your tattoo removal goals. For an effective treatment plan, we will look into the tattoo location, your skin type, and the amount of ink present in the tattoo. Following the evaluation, we will recommend a course of treatment for you to help achieve your tattoo removal goals. During the procedure, Dr. Ritacca will provide you a pair of protective eye shields to protect your eyes from the laser. To determine the most effective wavelength or energy level for your treatment, the doctor will conduct a laser test to check the skin’s reaction. He will use a small device that will pass laser pulses through the top layers of the skin to remove tattoo pigments. The PiQ04 laser system is of superior technology, as it’s effective at tattoo removal with only six treatments or less. The tattoo removal process is also quick, lasting only a few minutes. Tattoo Ink – Each pigment may be composed of several different colors that absorb energy at different wavelengths. It can take multiple sessions to target the different ingredients contained in just one ink. Having multiple PiQ04 lasers allows us to remove all ink colors (except white) safely and efficiently. Your Body – Everyone’s immune system is different. The process of tattoo removal involves fracturing the ink particles so the body’s lymphatic system can absorb and eliminate the foreign substance ultimately. Location of Tattoo – Different parts of the body respond differently to laser treatments. Because the skin varies in both dermal thickness and relative blood flow, one area of the body can respond quite differently to laser tattoo removal than another. Skin Type – Generally, lighter skin responds best to tattoo removal lasers of all kinds. However, we can work with all skin types and tones with great results. Tattoo Quality – Modern tattooing methods have made tattoos bolder, sharper and longer lasting than ever before. Homemade tattoos versus professional play a role in tattoo removal. The more ink in the skin, the longer the process can take. Patience – Tattoo removal is a commitment. However, it works. Your patience with our technology is the perfect combination and answer to your tattoo removal wishes. In most patients, clearance of tattoos will be more noticeable within four to six sessions. Call Ritacca Cosmetic Surgery & Medspa, Vernon Hills, at 847-367-8815 to set up your complimentary Chicago tattoo removal consultation, or click here to email us. We are currently serving the Libertyville, Gurnee, Mundelein and all surrounding areas. Patients can return to normal activities with limitations after the treatment. After the laser tattoo removal procedure, you may experience redness, which will subside several hours later, depending on the area being treated and the size of the tattoo. It is advisable to limit physical activity for 24 to 48 hours to minimize chances of irritation. Sun exposure should be limited until the treated area has healed completely as well. Dr. Ritacca will provide you with post-treatment recovery instructions to ensure that you will heal properly. See how effective PiQo4 laser is at tattoo removal. Please fill out the following fields. We’ll get back to you soon! Susie was wonderful. She made me very comfortable and did a very thorough job with the laser…. I have had 2 major procedures done and if I need any more this is the place that I will go. Nice staff, clean facility, knowledgeable doctors…. I’m so glad to have found your center. I will highly recommend you and will return for any needs I may have. Thank you again…. I was very impressed with how knowledgeable the entire staff was. Not only with the procedure I was there for, but all of the ones I asked about. Everyone was very nice and put me at ease, which I did not expect. I was afraid to come in without makeup, but I was made comfortable and felt very happy by the time I left…. Ritacca Cosmetic Surgery & Medspa, one of the leading Laser and Cosmetic facilities in the United States. Our surgeons and fully trained medical staff are experts in their fields and are committed to excellent patient care in the areas of cosmetic enhancement, non-surgical cosmetic treatments, and skin rejuvenation.